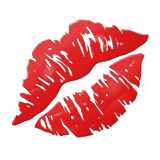 💋 Kiss Mark Emoji is the red print of the two lips that appeared after the kissing something with a lip gloss on. This romantic smiley is mostly used for flirting and means that you want to kiss someone, or have already done it. Less frequently issued as a friendly kiss for greeting or farewell, mostly between girls. 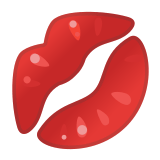 Kiss Mark Emoji was approved as part of Unicode 6.0 standard in 2010 with a U+1F48B codepoint, and currently is listed in 😀 Smileys & Emotion category. Use symbol 💋 to copy and paste Kiss Mark Emoji or &#128139; code for HTML. This emoji is mature enough and should work on all devices. You can get similar and related emoji at the bottom of this page.